In the same week that Mrs Margaret Thatcher became leader of the Tory Party in 1975, Angela Rippon began reading the Nine O'Clock News on BBC1 . Often referred to as the first woman television newsreader - though not quite correctly; Barbara Mandell appeared on ITV in 1955 and Nan Winton on BBC in 1960 - Rippon was the face of BBC evening news for five years (1975 to 1981), winning the Newsreader of the Year award for three of them. Leaving the grammar school system with an appetite for journalism, she served an apprenticeship as a junior reporter with Plymouth's Sunday paper, the Independent, eventually managing a young people's page and a women's page, and as a Services Correspondent in Aden in 1964. Later she joined BBC Plymouth as a TV and radio reporter (during the time of the Torrey Canyon supertanker disaster in 1967). In 1969, the south west region's ITV company, Westward Television , invited her onboard, and after a period as editor of Women's Programmes she became a documentary writer and producer. Rippon stayed with Westward for four years before she was lured away from an increasingly desk-bound producer's life by the prospect of work as a national news reporter for BBC Television. After two years on the reporter's job came the offer to read the Nine O'Clock News (BBC, 1970-2000) and later to present the current affairs programme Newsday (BBC, 1974-78). The following year her reputation soared when she appeared on The Morecambe and Wise Christmas Show (BBC tx. 25/12/1976) in a high-kicking dance routine (viewed by some 8.2 million homes). From the late 1970s, Rippon shared her newsreading with presenting programmes about the British countryside in Country Game (BBC, 1976-79) and In the Country (BBC, 1979-81), and the new BBC motoring magazine Top Gear (BBC, 1978- ). 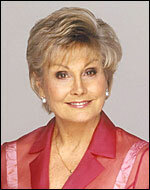 She also did a spell as presenter of the Antiques Roadshow (BBC, 1979- ), joining expert Arthur Negus in 1980. Along with fellow newsreader Anna Ford , Rippon became one of the 'Famous Five' presenters (with Michael Parkinson , Robert Kee and David Frost ) who launched Britain's second breakfast television series, Good Morning Britain (1983-92), for TV-am . Despite the glittery line-up of celebrities who had helped win TV-am their breakfast slot franchise, in just two months the company was running at a loss ( Good Morning Britain achieving a peak viewing figure of only 400,000, compared to the 1,700,000 gained by the BBC rival Breakfast Time ). Chief executive and chairman Peter Jay was ousted and Timothy Aitken took over as chief executive. He fired both Anna Ford and Rippon (for 'breach of contract'). While Ford was snapped up to read the news on the BBC , Rippon was out of work for a year. The experience came close to wrecking her career. But then, in early 1984, she was invited to be the Arts and Entertainment Correspondent for NBC affiliate station WNEV-TV in Boston, Massachusetts. She stayed with WNEV-TV for a year, enjoying a rewarding job that helped restore her old self-confidence after the TV-am debacle. Following her return to British broadcasting, Rippon hosted the popular quiz shows Masterteam (BBC, 1985-87) and What's My Line? (ITV, 1984-90), as well as the perennial Come Dancing (BBC, 1949-95). In more recent years Rippon has alternated presenting jobs on Channel Four 's The Big Breakfast (1992-2002), the health issues magazine Watchdog: Healthcheck (BBC, 1995- ), as guest host on Open House With Gloria Hunniford (Channel 5, 1998- ) and The Wright Stuff (Channel 5, 2000- ) with her ITV News Channel programme, Live With Angela Rippon (2004- ). She was awarded Order of the British Empire (OBE) in the Queen's Birthday Honours in June 2004.